As 2016 starts, EUCLID is rolling out is new LMS platform and discusses the work being done by the EUCLID team with International Faculty Coordinator Pr Laurent Cleenewerck. EUCLID: Can you tell us about the work being done on EUCLID’s new LMS platform? IFC: EUCLID has used an internal system called “Elements” to manage its entire system of programs, courses, students, etc. since 2006. The platform is incredibly powerful in terms of international management of our academic operations, but not cutting-edge compared to recent LMS platforms such as EdX or Coursera. Our goal was to have a world-class LMS platform that would be flexible and that would remain under EUCLID’s control for custom development and integration with our internal system. EUCLID: Did EUCLID evaluate Moodle and Blackboard? IFC: Yes, we did evaluate what seems to be an inordinate number of possible platforms including Moodle, BlackBoard, ATutor, Cavass, Sakai, etc. This took several months in 2015. I have experience with Moodle which I use when teaching for the Ukrainian Catholic University, and actually argued against using it. Still, we did install a test Moodle platform for evaluation and comparison. We also considered adopting OpenEdX and spent quite a bit of time and money getting a test platform up and running. Then, we decided against it… It was a frustrating process. EUCLID: So, what platform was selected for adoption? IFC: In the end, we wanted a platform that would be hosted by EUCLID and run with WordPress because it has become a de-facto CMS standard with excellent performance and responsiveness. WordPress is quite stable and secure when combined with Sucuri as a gate keeper, and several EUCLID sites already run on WordPress. After evaluating all the possible WordPress LMS solutions, we opted for LearnDash which was very flexible in terms of customization with plugins and other add-ons. 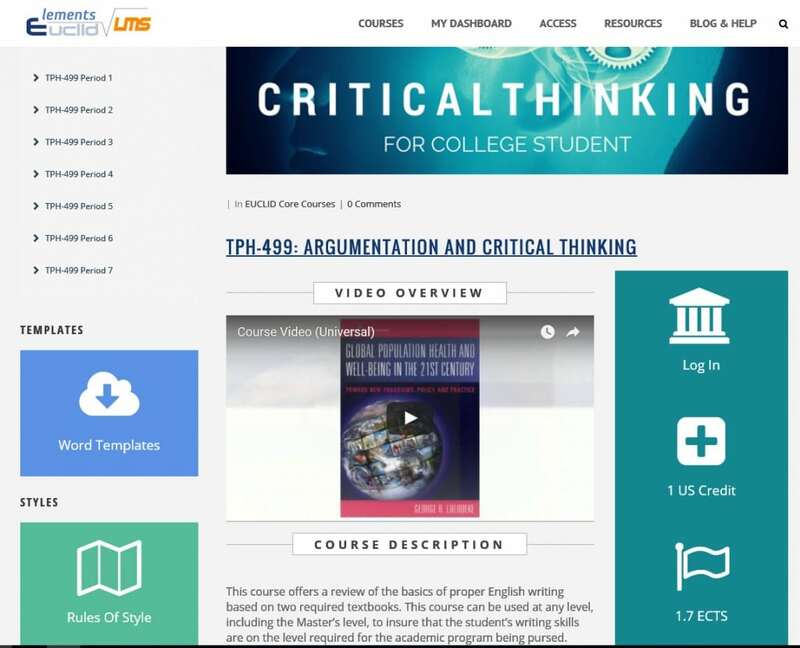 Mainly, my personal goal on this project was for the EUCLID LMS platform to be as comparable as Coursera as possible, because I had just completed several certificate courses on that excellent platform and felt that it set the standard very high, as we could expect from a well-funded Silicon Valley company. IFC: Coursera is a proprietary platform with no open-source option like OpenEdX. We could have programmed it into our current platform, but we determined that LearnDash was able to achieve excellent results with expert use of themes, customization, plug-ins and add-ons. Now, Coursera is not a very good platform for long, in-depth, degree-granting programs, but it works well for short certificate programs with video lessons that last 5 to 20 minutes, with quiz interruptions. At EUCLID, we needed to structure each course in seven periods, with each period covering a substantial amount of PDF material to read. We also wanted to supplement the reading assignments with multimedia, for which we use Vimeo and YouTube. We were able to do this very successfully with LearnDash and ended up building our new ELEMENTS v2 platform which is a tremendous achievement for EUCLID. EUCLID: What Moodle or Coursera feature did were you able to incorporate in EUCLID’s new LMS platform? IFC: Basically, all the key features from these platforms of reference are in there: videos for each lesson, structured course progression with timed-drip and deadlines, easy uploads of assignments, end-of-course quiz examination, certificate issuance upon course completion with Credly credits, direct and secure access to proprietary textbooks, etc. Overall, the team is adjusting very well to the platform which is proving to be of tremendous value to our students globally. EUCLID: What is the timeline for full roll-out? IFC: As of 01/01/2016, all new students are oriented and launched on the new platform, which means that ACA-401 and TPH-499 were fully operational before the end of 2015. The other courses, about 100 of them, will be converted to the new platform by the end of January.